Auction #1041 Lots Posted. Browse and Bid Now! Our Sunday Internet Auction #1041 offers a fantastic selection of 260 New Items, along with 60 Special No Reserve lots and 25 Vault Value items. From the great state of Idaho comes the Couer d’Alene Colonial Collection! This fascinating selection of early Americana pieces offers bidders in Auction #1041 an opportunity to add extremely low population coins to their collection at very reasonable levels. Each coin is running as a part of our Guaranteed Auction Program which means there will be a 100% sell through on all 34 pieces. Highlights from the sale include a 1779 Rhode Island Ship Token PCGS MS60 (Wreath Below, Pewter), a 1789 Mott Token PCGS/CAC MS62 (Thick Engrailed Edge), a 1767-A French Colonies Copper Sou PCGS/CAC MS63 BN and an 1820 North West Co. Brass Token PCGS VF30. Be sure to view these and all the unique selections available in Auction #1041, closing Sunday, December 2nd. Our first highlight is an 1843 25c PCGS/CAC Proof 65. This coin is an incredibly scarce early proof from a mintage of just 10 pieces. Our example has lovely blue and lavender highlights with deep maroon tints. Formerly graded as Proof 66 by NGC, this piece is clearly the finest amongst the six pieces known to remain, with only four or five available to public collections. This week's second highlight is a 1900-O/CC $1 PCGS/CAC MS66+. The 1900-O/CC is a very popular Morgan dollar variety. Our example is CAC approved for quality and has the PCGS+ grade showing premium quality at the top of end of the assigned grade. Our final highlight is an 1852 1/2c PCGS/CAC Proof 66 RB (Restrike). This beautiful gem, certainly deserving of the CAC seal of approval has gorgeous golden copper tints with light green highlights. Of course there are many other highlights, so be sure to browse all lots in this exciting new sale before it closes on Sunday, December 2nd. 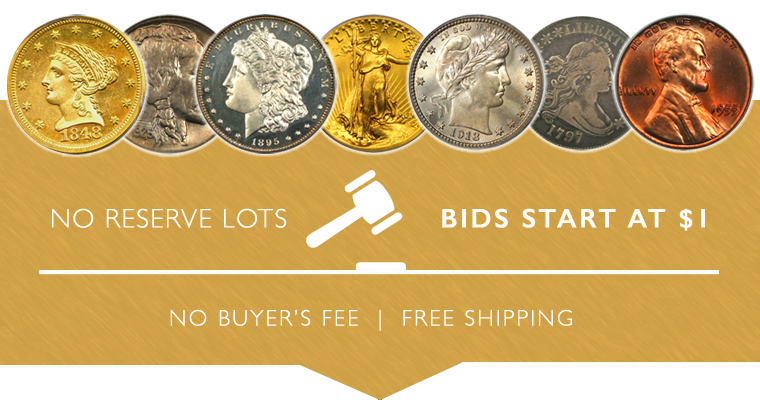 If you have any questions about coins in our auctions, or items for direct purchase, please call us at 800-776-0560, or send an email and we will get back to you immediately. Thanks for browsing our inventory and participating in our auction! Buyers, seller and auctioneer of U.S. rare coins certified by PCGS, NGC and CAC.